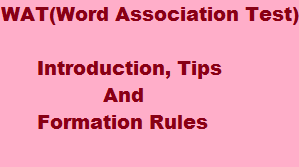 4 comments to ''How to Form Good Positive Sentence in WAT (Word Association Test) in SSB"
I have doubt at point no 11, why we should not start the sentence with original word. Friends let me tell u that what ever you are about to read in instructions are all not applicable in ssb.. You just make your approach correct. It dosen't matter if you start your sentence with the initial word or anything else. Just go for possitive sentences...let me tell you if you get stuck in few words dont hesitate to write common sentence instead of leaving it...we are not dictators. Just write with sense thats it... I, must and never are approachable in WAT...I have done the same and got recommended...Telling with my personal experiance.